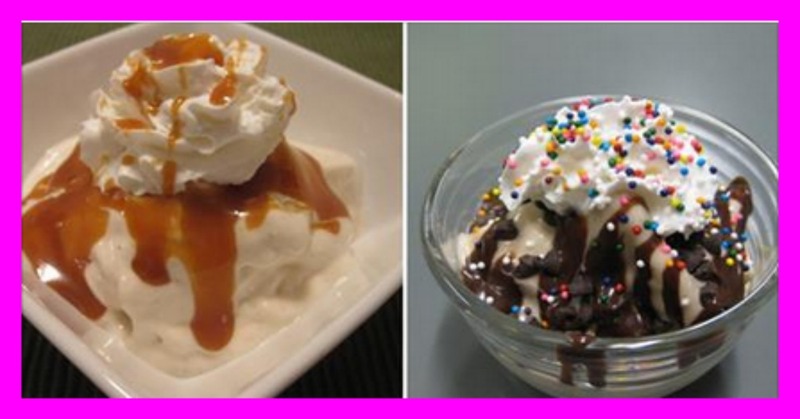 It only takes 3 simple steps to make a 0 Points+ Healthy Banana Sundae. This recipe is so easy to make and honestly tastes just like ice cream ~ super creamy, super rich and fluffy like whipped cream. It melts in your mouth and is guaranteed to cure any craving you have for the real deal. 1. SLICE and FREEZE your super right bananas. It’s really important to slice your bananas BEFORE you freeze them or you can burn out the motor in your blender, chopper, food processor, etc. I didn’t feel like busting out my Food Processor, so I pulled out the next best thing ~ My Black & Decker Mini Chopper. 2. Add a splash of vanilla extract and 1 Tbsp of Fat Free Milk, ,Almond Milk or Chocolate Almond milk and blend away until smooth and creamy. You may have to add 1 additional Tbsp of milk if it’s too thick. Looks just like ice cream, huh? 3. Heat 1 Tbsp of your favorite caramel sauce (it spreads further if it’s hot) and drizzle with a little whipped cream. * Strawberry Banana Frozen Yogurt ~ Add 4 oz Fat Free Strawberry Yogurt with 3 Strawberries.